The Berenstain Bears’ New Baby tells how Small Bear got a new, larger bed–very useful, since Sister Bear was soon to be born, and could use his old bed. This is a standard kind of children’s book–what happens when a child gains a younger sibling? I like this one a bit better than Thumper’s Little Sisters, which I reviewed earlier. The story begins with Small Bear waking up and finding he is too big for his bed, so he and Papa Bear go out to make him a new bed, and Mama Bear pats her belly and says “You’ve outgrown that snug little bed just in time!” And ‘just in time’ it is, indeed. By the time Papa Bear and Small Bear get back, Mama Bear’s belly is quite a bit smaller, and a baby is lying in his old bed. Small Bear reflects that it will be fun to be a big brother, and so it ends. One thing I like about this story is that Small Bear doesn’t dash off and cry out that he hates his new sister or anything like that. It’s very common in these kinds of stories for the older sibling to be quite put out by the new baby–fair enough, I guess it’s probably common enough in real life, too. Still, it’s nice to have some books where the older sibling reacts positively to the news. The artwork is nice. The style has evolved a bit since Inside Outside Upside Down, and quite a lot since The Big Honey Hunt. It’s nearly in the modern style. It does have fewer full-page illustrations that usual, though. This is the first Berenstain Bears book that I’ve read (chronologically, I mean–it is the earliest published) that is written in prose rather than verse. It’s not a huge loss, since the Berenstain’s seem not to be terribly good poets, but I still miss it a bit. The writing, being intended for children, is quite simple and unsubtle; on a page showing their house, for example, it says: “It was a very fine house. This is what it looked like inside.” This is a little tiresome to read, for an adult, but it seems to be the common style for children’s books, so I guess we must forgive this failure. 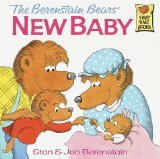 The Berenstain Bears’ New Baby is a nice book for children expecting a new sibling. Surrounded by mountains of books insisting they should (at least at first) hate their new siblings, children may find better guidance from a book that assumes they may actually enjoy the prospect. Unlike The Bear Scouts, this one is available on Kindle , as well as paperback and hardcover editions. If the situation calls for it, give this one a try. Thumper’s Little Sisters tells how Thumper came to save and be saved by his three new sisters, and learned that his parents still loved him, even though he had new siblings. As is obvious, the main purpose of the story is to teach kids to accept younger siblings, a fairly common theme in children’s books. It’s pretty heavy handed (“And he never again thought that his mother and father did not love him. He knew that they did.”), but that’s also normal for a children’s book. The story isn’t nearly so satisfying as in the previous book in the Walt Disney Fun-to-Read Library, Mickey Meets the Giant, but it’s passable. The illustrations are again quite good–actually, better than those in Mickey Meets the Giant, since they tend to show the background much more, whereas in the previous book, many of the illustrations were just kind of floating in a white space. Thumper’s Little Sisters is a decent children’s book, saved by the high quality of its illustrations. I can’t imagine even children wanting to read this one very often, but it’s not bad as part of the series.